Exchange of telephone connections is based on the SIP Trunk telecommunications system – HIPERUS Carrier to Carrier (C2C), or a voice wholesale. 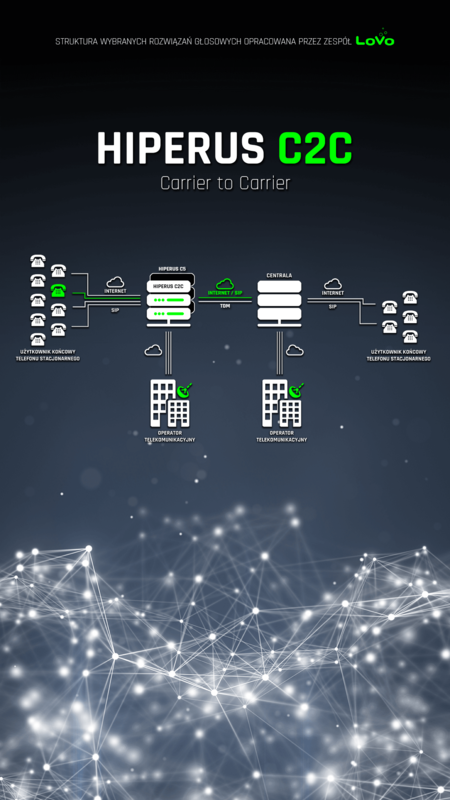 The system allows the implementation of transit and termination of telecommunications connections directed to the LoVo network by domestic and international partners. SIP Trunk is a telecommunications service that uses SIP (Session Initiation Protocol) based on which telephone calls are made using the Internet. SIP Trunk, is the transit of domestic and international traffic (voice wholesale) is a solution of high reliability. It has been designed to allow uninterrupted operation even in the event of failure of one of the system components. Servers and a platform to manage routing and price lists based on which the mechanism is built are prepared for uninterrupted operation. The system is redundant, scalable and allows you to easily increase bandwidth. Network connections can be implemented both in traditional TDM technology, based on E1 (G.703) links with DSS1 or SS7 signalling, as well as in VoIP technology with SIP signalling. In the case of using the VoIP technology, the Operator may choose a direct link or exchange of traffic over the public Internet network. Lending numbering – the ability to use the LoVo competence to quickly and effectively extend numbering pools belonging to the Operator. Distribution of numbering – use of LoVo competence to broadcast the home subscriber numbering of the operator allocated by the decision of the President of UKE. Access to PLI-CBD (Localization and Information Platform with a Central Database) – connection to the PLI-CBD platform enabling the performance of duties specified in the Telecommunications Law. Number portability – support in the process of transferring subscriber numbers (Number Portability – NP) from and to the network of another national telecommunications entrepreneur. Outsourcing services, e.g. : construction of network interconnection points, provision of billing services, monitoring of services and connections, etc. Why is the transit of domestic and international traffic worth realizing with LoVo? LoVo has many years of experience in voice wholesale serving operators on the domestic and international market. It is also in the group of a few companies with the largest number of points of contact with domestic and international operators. Contact points with over 800 operators both in Poland and in the world. Many years of experience in the market of inter-operator services. Full range of technologies (both TDM and VoIP). Constant monitoring of the network and level of service quality. Proprietary solutions for routing management and price lists. Professional and experienced sales and technical team. Our proposal is the cooperation with a stable entity offering the highest quality at an optimum price. In addition, our Partners can use advanced and intelligent service platforms enabling the provision of additional services to their customers. Attractive prices of connections and services – LoVo network services mean the competitive price of telephone calls and value-added services. Lack of investment barriers in infrastructure on the part of the partner – additional services allow for significant reduction of infrastructure investments on the part of the operator. Short time of service launching – counted in single days from the date of ordering or signing the contract. We are open to the SWAP cooperation model. A wide range of additional services – additional services (including portability, lending and numbering broadcasting, access to PLI-CBD, outsourcing services) make it easier for the operator to operate in a competitive market. 24-hour service monitoring – the service is monitored 24 hours a day, 365 days a year by dedicated engineers from the LoVo’s Network Operations Center (NOC). Operators, Resellers and Integrators with their own telecommunications infrastructure. Companies serving residential, office buildings and shopping centres.